Valentine’s day is just around the corner. I wanted to get something out of the box this year for Josiah and my gal pals. I’ve gathered my favorites from Uncommon Goods. As you can tell we’ve taken a liking to whiskey over the last couple years. 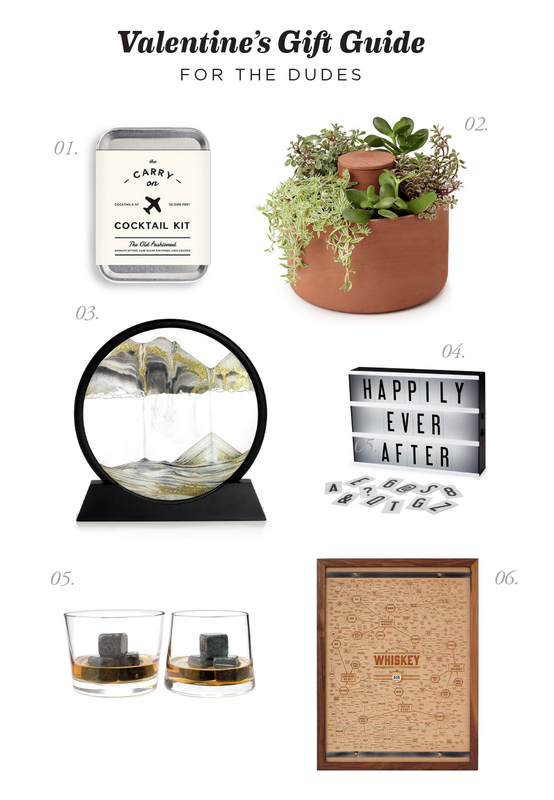 Most items we’ve been gifting each other lately, revolve around decorating the house. Before I started searching the dude section, I picked out a few pieces for my lady friends from the jewelry section. Minimalist jewelry has been catching my eye lately. I’m kind of burnt out on the whole statement necklace/bib trend that happening over the last several years. Here are a few minimalist pieces that struck my fancy. Natural stones will always be my first love when it comes to accessories, I found several here. 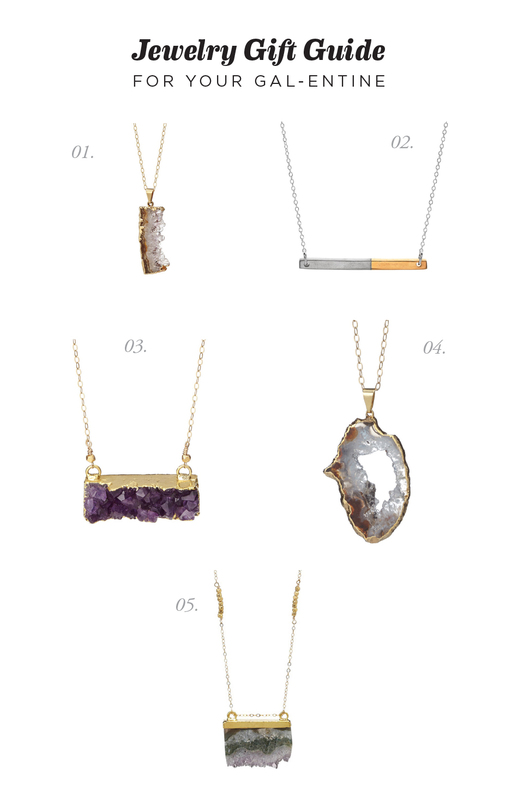 Here are my top 5 picks from the necklace section. I know, I know I’m a little obsessed with stones, but nature is just more interesting than plastic costume jewelry! 01. Amethyst Slice Necklace. I think this piece would help elongate the body while creating a fun texture over a white t-shirt. 02. Gold & Pewter Mini Bar Necklace. This piece is a fun play on the traditional vertical necklace. Go for something horizontal to change it up. 03. Druzy Rectangle Necklace. I like the contrast between the deep purples and rich golds. 04. Amethyst Geode Necklace. The whole in the middle makes the piece feel even than much more organic and natural. My favorite selection of the bunch. 05. Golden Slice Agate Necklace. I like the jagged edges of the stone, directing your eye downward. 01. Carry On Cocktail Kit: We’ve both been doing more traveling this year. It’s always nice to have a little carry on kit for your long trip in the air. 02. Self Watering Planter: We have a plethora of plants in our house now I thought this would be a great gift, as we both forget to water our succulents. 03. Deep Sea Sand Art: When I saw this I immediately knew Josiah and I would both love it. We’ve always wanted a big fish tank but don’t want to deal with the maintenance. I this this would have a nice calming event in the bedroom. 04. DIY Cinema Box: I recently saw one of these on Instagram and loved how you could personalize your message. 05. Whiskey Stones: We have a few of these in the freezer now but are always lacking when we have friends over. It would be nice to have a full stash so no one feels left out. 06. Whiskey Wood Engraving: I love a good typographic print, but this wood engraved piece takes it to the next level. This reminds of the ideation maps I’m always making at work. I hope this helped give you a couple ideas for your dude or a girlfriend (because ladies love whiskey too!) We’ll probably try out a recipe at home that we’ve been wanting. I’m thinking home made peanut butter cups for dessert. What do you guys have planned for valentines? Are you hanging out with friends, doing a formal date or ignoring the holiday all together?